State Refinery Gold Buyers address, phone, website, and more. Want to sell unwanted gold jewelry for cash? 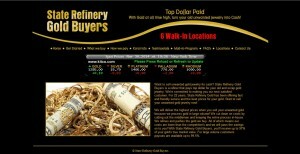 State Refinery Gold Buyers is a refiner that pays top dollar for your old and scrap gold jewelry. We’re committed to making you our next satisfied customer. For 22 years, State Refinery Gold has been offering fast and friendly service and the best prices for your gold. Start to sell your unwanted gold jewelry now! We will deliver the highest prices when you sell your unwanted gold because we process gold in large volume! We cut down on costs by cutting out the middleman and keeping the entire process in-house. We refines and purifies the gold we buy. All of which means our costs are lower than the competition’s and we will pass the savings on to you! 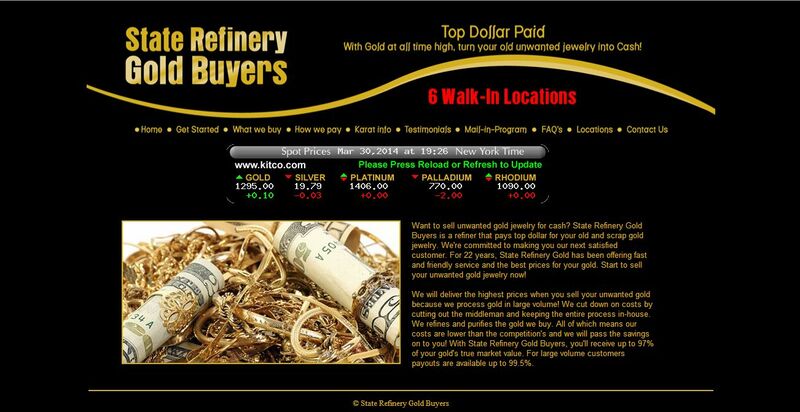 With State Refinery Gold Buyers, you’ll receive up to 97% of your gold’s true market value. For large volume customers payouts are available up to 99.5%.